Today, our super sweet boy, Henry, turns six. He is kind, clueless, and oh, so loveable. Oh, he's also a ham. Favorite Thing To Do Outside: Play games with my friend, Nicholas. Swing and ride my bike. Happy Birthday, Ninja Turtle Obsessed Buddy! We love you! Want more Henry? Check out his birth story HERE and the answers to his 5 year old questions HERE. What started as two small spots turned into enormous, swollen, warm to the touch welts. My poor little guy! Luckily, consistent with his personality, Henry had no clue that anything was even wrong with him. He felt fine and wasn't bothered by any of it. So after lots of discussion with the nurse and his doctor the thought is that he has "cold induced hives" which is technically called Cold Urticaria. Who knew you could basically be allergic to the cold? In hindsight, there have been a couple of times that he had come in last winter where his ears were itchy and swollen but I didn't think too much of it. With sensitive skin and the change from cold to warm I feel like stuff like that happens. 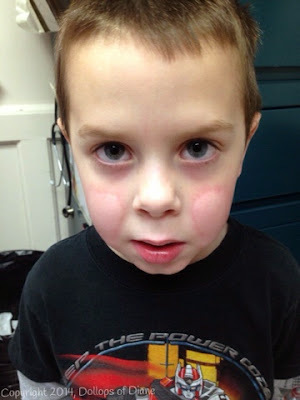 On Monday, he had a hat and gloves on so it was just his cheeks that were exposed and that's where the reaction occurred. It was also a cold day (maybe 30?) with a windchill. So the treatment is for him to stay up in his room all winter and never leave the house. Kidding! The doctor recommended giving him Claritin or Zyrtec on really cold days to help prevent a reaction. He also needs to be bundled up with the least amount of skin showing as possible. 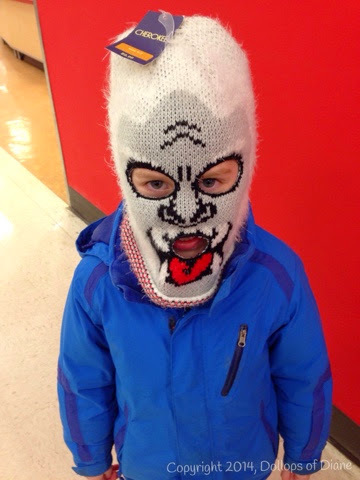 So we headed to Target that night and I let him pick out some new winter gear. Of course, he picked out the most ridiculous hat which he LOVES, LOVES, LOVES so we went with it. So some meds, a crazy new hat, and keeping an eye on it are what we are doing for now. Hopefully, this was the worst of it but in severe cases it can lead to difficulty breathing and even require an epi pen prescription. Crazy, right? Never a dull moment with kids! On the plus side, this situation only further proved what a great public elementary school my big kids go to. Henry's assistant teacher stayed with him the whole time, the nurse consulted with other medical personnel in town, and the principal checked in on him (Henry loved that he knew his name!). I also had follow up calls/emails with the nurse and Henry's teacher called me the next day to touch base. They handled an unknown and potentially scary situation so well and made Henry feel special. At the end of the day I had a healthy kid and a great school system - what more could I ask for? T'is the Season for lots of gatherings with family and friends and lots and lots of food. It's a glorious time of year that often makes me want to live in stretchy pants. Along with the awesomeness though can come stress. It's hard to prep meals and bring dishes to parties when we're all busy doing a million different things. This year Stop and Shop is looking to help ease some of that stress! Stop & Shop has expanded their exclusive Simply Enjoy brand, a collection of gourmet products made with the finest ingredients just in time for the holidays. Simply Enjoy products for this year include new frozen appetizers and desserts, deli pastas, seafood sauces, and chocolates, as well as dipping oils, sorbetto/gelato, hummus, crackers and sparkling sodas to name just a few. They can add something special to your festive occasion or make a great gift for the foodie or hostess on your list! New to an already broad assortment of roasts, Stop & Shop is also introducing Boneless NY Strip Roasts as a new centerpiece roast for your holiday meal. They've compiled numerous recipes that share plenty of preparation ideas and also put together a video tutorial on the best techniques to carve a roast. Stop and Shop also has a recently launched Recipe Center with more than 2,500 every day and special occassion recipes. They feature weekly recipes that include ingredients that are currently on sale, how-to videos, and nutrition information. I just browsed through some of the desserts - umm, yum! Want to try out an item from the Simply Enjoy brand or even just pick up a bag of chips last minute on the way to a party? Well then enter to win a $25 gift certificate to help you on your way! 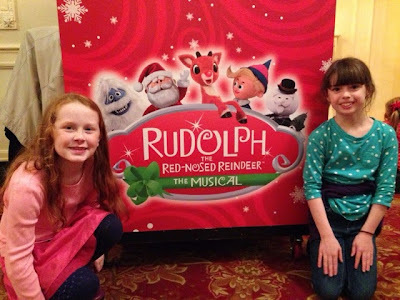 Rudolph The Red-Nosed Reindeer: The Musical Review! Waiting for the show to start! 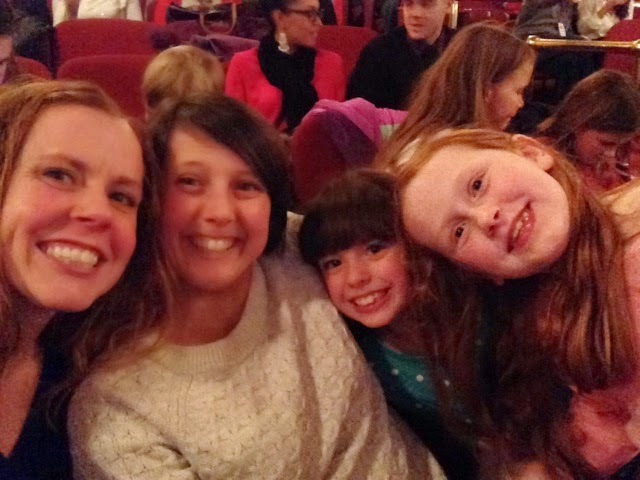 Last night, Isabelle and I went with our friends The Vintage Mom and her daughter, Caroline, to see opening night of Rudolph The Red-Nosed Reindeer: The Musical. As anyone from the Boston area knows, the weather was less than stellar yesterday so we were hoping that the show would be worth a long ride in the rain. Luckily, it was! The musical was the perfect show to bring your whole family to. Not fully knowing that ahead of time, we decided to make it a girls' night which is always a guaranteed fun night either way! This is our intermission high on Sour Patch Kids, Popcorn, and Junior Mints! 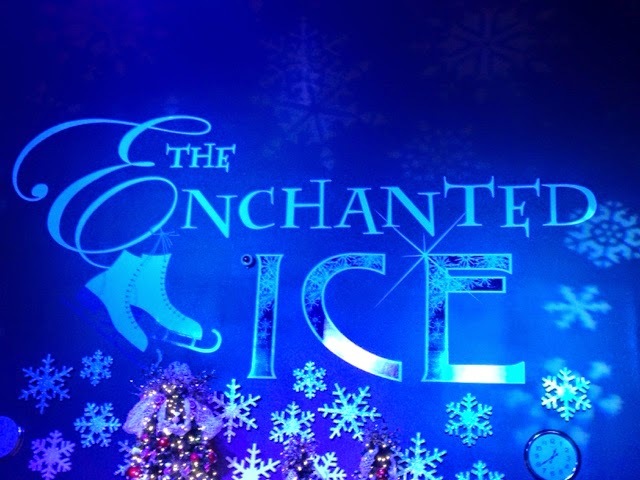 Now that I've been to the show though I would definitely recommend it for all aged kids. The show ran about an hour and a half total (including intermission) so even wiggly kids could probably last through it. The show had all the beloved characters from the televsion show and as always, Hermey was my favorite. There was singing, dancing, and action that kept the girls' attention for the whole show. They even ended the night with a cast/audience sing along. Now does that scream family fun or what? The show is only running for a short time at the Shubert Theatre so make your plans now if you want to catch it! Rudolph the Red-Nosed Reindeer: The Musical plays at the Citi Performing Arts Center Shubert Theatre, 265 Tremont St., Boston, Tuesday, December 9 – Sunday, December 14, 2014, for 12 performances: Tuesday through Saturday evenings at 7:00 pm; morning matinees on Thursday, Saturday and Sunday at 10:00 am; and afternoon matinees at 1:00 pm and 4:00 pm on Saturday and Sunday. Tickets are priced at $28.00 - $68.00; all prices include a $3.75 facility fee per ticket and are on-sale at www.citicenter.org or by calling (866) 348-9738. Groups of 10 or may reserve tickets now by contacting Citi Performing Arts Center Group Sales at (617) 532-1116 or groups@citicenter.org For more information, visit www.citicenter.org. I was recently at the grocery store and came across a middle aged man staring at the yogurt section. When I approached the display, he said, "Excuse me. Do you know anything about yogurt? What kind should I get?" Come to find out he knew absolutely nothing at all about yogurt. He didn't even know if he wanted regular or Greek. He said he thought he heard that Greek was better. 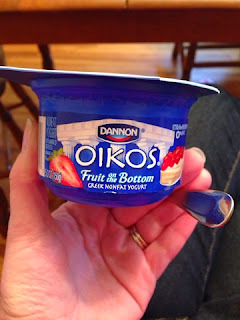 I let him know the nutritional benefits of Greek (because apparently I'm a yogurt expert in this story) but said the taste is off putting for some. After some discussion, he piled up his cart with an assortment of greek yogurts and we parted ways. 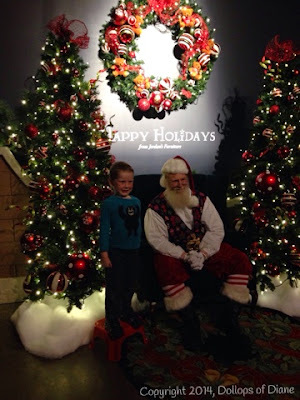 On Tuesday, Daniel and I headed to the Enchanted Village at Jordan's Furniture in Avon, MA for some holiday fun. Daniel enjoyed checking out the vintage store displays and particularly loved when they made it snow (aka bubble). Since the displays are free, I figured we could do one fun thing that costs money there after we were done. Of course, Daniel made a beeline for the indoor ice skating rink. Now please note that Daniel has never been ice skating before and I've only been once as an adult. We decided to throw caution to the wind though and go for it. He was a MANIAC on the ice - a complete maniac. 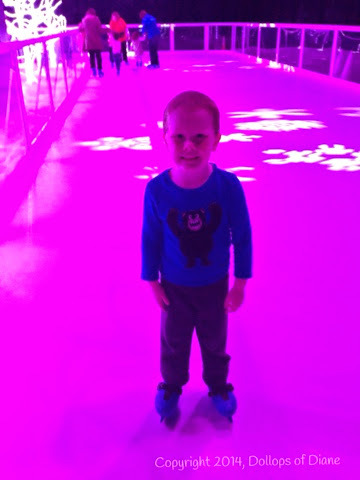 He had no fear and just bombed around on the ice. He would completely wipe out (sometimes I think on purpose) and then hop back up and go for it again. He had a BLAST. It was so great to see him having so much fun. After ice skating and grabbing a snack from the concession stand, we headed out to find Good Old St. Nick with no lines, no waiting so Daniel snagged a quick picture with him. He wouldn't sit on his lap but he would stand next to him! So all in all it was a super great day for Daniel. It totally pays to be the youngest who isn't in full day school yet! If you're looking for something fun to do this holiday season you might want to check Jordan's out. I would imagine that it's packed on a weekend so just be prepared for lines/waits if you go then. We waited in a short, fast moving line for the Village but no other lines. The Enchanted Village itself is rather small so you might want to consider doing one of the cost activities as well. Ice skating was $5/person which included skate rentals so not too bad. It said it was a half hour of ice time but we were on it longer. I imagine if it was busy they might ask people to stick to the time schedule. 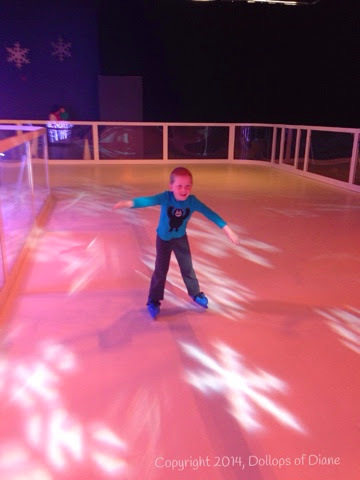 We were the only ones on the ice at some points though so I don't think it mattered. They also have a 4D Polar Express Movie Ride ($6/person - 40 inch height requirement) as well as a holiday laser light show ($5/person, all ages) that cost additional money. You can also purchase professional pictures with Santa for additional costs as well (or just snap a pic with your phone like I did!). Looking for something fun to do on Saturday? Look no further! 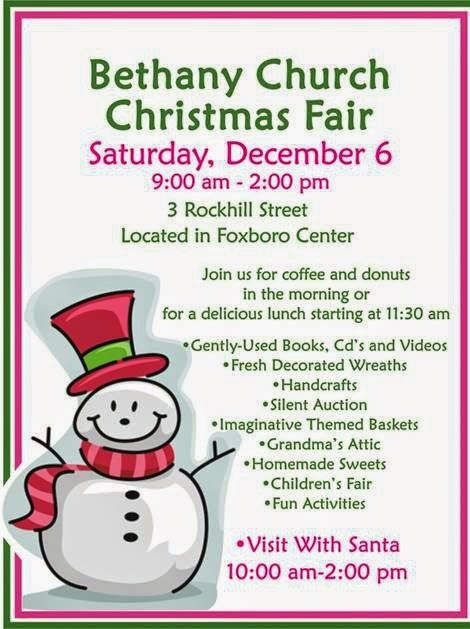 Head on over to Bethany Congregational Church in Foxboro, MA for their annual Christmas Fair! They'll be lots of fun for the whole family. You know you want to give these toys a new home! So many people are working so hard to make this a great event for the church and community. 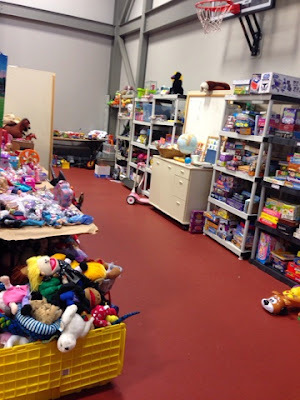 I'll be there all day Saturday in the "Toy Room" so stop on by and say hello!